The following is an announcement by Carol Carlson, Chair, SCWTCA Endowment, Inc. This database was originally developed by the Berner-Garde Foundation 30 years ago and is in use by several other breeds in addition to Wheatens. Starting with San Jeffries database of 46,000 dogs, a team of volunteer data operators has added dogs so we are debuting with records on nearly 60,000 Wheatens from around the world. In furtherance of the Endowment’s mission, we believe the detailed collection of health and pedigree information in the database will help to identify, track, and reduce the incidence of health problems in the SCWT. Wheaten owners, breeders, and researchers can use it to assist with decisions about the care and welfare of their dogs and to make breeding decisions. We expect veterinarians and veterinary researchers working with Wheatens will find it a valuable data resource. The integrity of the information in the database is vital to its purpose. Much of the data comes from voluntary submissions from owners, which is verified before being published. Publicly available information, such as records from kennel clubs and OFA is also included as verified. The best way to appreciate the potential of the Database is to use it! It is accessible to all at www.scwtdb.org once you’ve read and accepted the policies. Start by looking up your own dogs and seeing what the Database can do… from producing pedigrees to searching for dogs meeting specific criteria. (While the Database is easy to use, you’ll also find a link to a User’s Guide on the home page.) This will show you how you can help... by submitting information on your own dogs to make the Database more robust. There are forms for sending information to add…and you can upload photos of your dog, both formal show shots and informal candids. 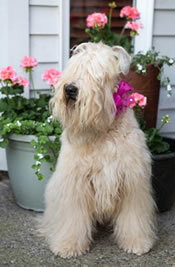 The Endowment is happy to provide this database to the Wheaten world free of charge. We welcome donations to support it and our other research projects.